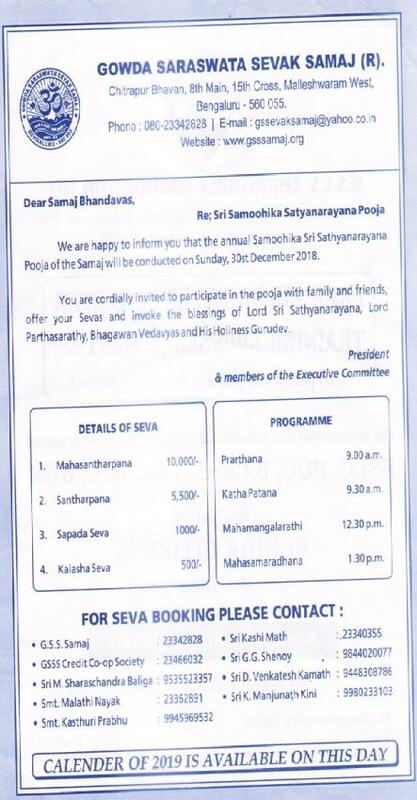 We are happy to inform you that the annual Samoohika Sri Sathyanaryana Pooja of the Samaj will be conducted on Sunday, 30th December 2018. You are cordially invited to participate in the pooja with family and friends, offer your Sevas and invoke the blessings of Lord Sri Sathyanarayana, Lord Parthasarathy, Bhagawan Vedavyas and His Holiness Gurudev. I take this opportunity to thank each one of you for having reposed your confidence in me & elected me as the President of Gowda Saraswat Sevak Samaj for the current term of 2013 - 2016. Shri Bhuvanendra Medical Mission a unit of GSSS Charitable Foundation will be inaugurated on Tuesday 16th Feb 2016 by HH Srimad Samyamindra Thirtha Swamiji. G.S.S.S Charitable Foundation introduces 'Annadaata Sukhibhava' - Seva. Shruthi Geeta was recently presented to Partagali Gokarna math seer by Sri Vishnu Shanbhag of Kumta. This was at HH’s Sagar chaturmasa programme. Members of Gowda Saraswat Sevak Samaj, Malleswaram Bangalore welcome Shri Padmanabha Acharya, the new Governor of Nagaland and Tripura at Bangalore Raj Bhavan on Sunday, 27th July 2014.